In his book “A Bridge Too Far” WWII specialist Cornelius Ryan describes a perilous operation undertaken by members of the 82nd Airborne, one which involved paddling across a canal in the Netherlands in nearly-unmanageable wooden assault boats with canvas sides, before splashing ashore and trying to take the area from German defenders. A gust of wind blew away most of the smoke that was supposed to cover their approach, allowing the enemy to begin picking them off like ducks in a shooting gallery. Some of the small boats capsized and sank with all hands, or arrived with a crew of bullet-riddled corpses. Incredibly, tattered remnants of the assault force scrambled ashore alive. Lt. Col. Vandeleur of the Irish Guards described what happened next. Shortly after the movie version of Ryan’s book hit theaters in the late 1970’s, I remember reading a clarification about who had shown the most gallantry that day. No, it wasn’t the men who were surprised and delighted to make it across the canal alive and then hit the opposite bank running and firing who were the real heroes that day. The bravest men had to be the second wave, who had watched their comrades get shot to pieces before dutifully stepping into the returning boats to take their turn navigating the deadly waters. 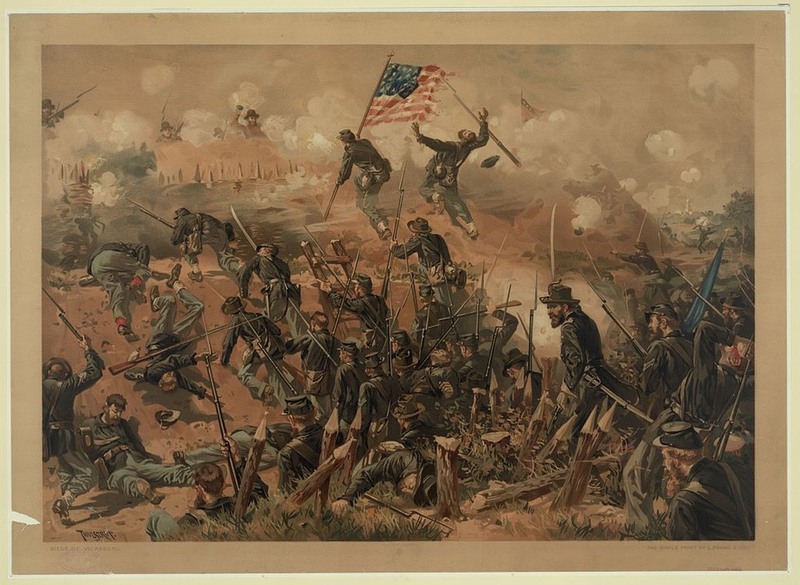 I was reminded of the episode while reading about the Vicksburg campaign of the American Civil War, especially the events of May 22, 1863, the day Christopher Lovewell and a host other men from Illinois where mowed down by enemy fire. Christopher was part of the Illinois 72nd Infantry, the so-called “Chicago Board of Trade Regiment” which had had been mustered into service the previous August. Christopher was part of Company “I,” composed of about 140 men from Fulton and Knox counties in Illinois, whose uniforms may not have sported the “Board of Trade” insignia. A group of 26 men in “I” were Christopher's neighbors from St. Augustine, some of the very first men and boys of the 72nd who enlisted together on August 21, 1862. When I found the roster of Christopher’s company, I expected to see a record of awful carnage borne disproportionately by neighboring families in western Illinois. For a time I had believed that Christopher and the other boys from Illinois might have been members of a “Forlorn Hope” unit, selected for a fool’s errand. 150 men were supposed to lug pieces of a crudely-prefabricated log-and-plank bridge across hundreds of yards of ferociously-defended ground. According to the plan, the first wave of soldiers would heave logs into place across a water-filled ditch, followed by men carrying planks to be laid over the logs. The resulting bridge was intended to become a causeway for other Federal troops equipped with ladders, who were waiting to pour across the bridge and scale the next obstacle in their path, a 17-foot high wall of earth defended by a honeycomb of rifle batteries. It seems unlikely that Christopher was part of the initial storming party, which was composed mostly of men from Ohio. Since theirs was considered a suicide mission, soldiers such as Christopher Lovewell with a wife and children waiting for him, would not have been allowed to volunteer for it. Christopher must have been part of another assault force that day at Vicksburg, men with no illusions about what was waiting for them. Grant had ordered an attack three days earlier that faltered under withering fire and resulted in terrible casualties for the Union. The general chewed his cigar for a few days and mulled over his options before agreeing to send men into battle lugging logs and planks and ladders. It may have seemed worth a try. Fortified by hardtack and coffee, troops set off on the morning of the 22nd and were met by a hail of lead. Even men who survived untouched or with only slight wounds, reported that they could have scooped up a hatful of minié balls and grapeshot that lay on the ground all around them or had burrowed an inch or so into the earth beneath their bodies. In 20 minutes of fighting, the 72nd Regiment alone lost 96 men killed or badly wounded, about a quarter of their strength. Their casualties were considered typical for the units fighting that day. Seeing such disheartening loss of life on the 22nd, General Grant decided to take Vicksburg by siege. He accepted the surrender of General Pemperton on July 4. Many of the men serving with Lovewell in “I” Company at Vicksburg were friends or kin. There were 2 men named Abbott. One of them, Orin H. Abbott, appears to have been Christopher’s brother-in-law, his sister Rhoda’s husband. Two were named Honts, including Daniel, who was Christopher’s father-in-law, paired with another brother-in-law, Daniel’s son James E. Honts. Both Honts men survived Vicksburg, although Daniel was transferred to the Invalid Corps in 1864. A neighbor named George Leeper died, probably from wounds received in the first bloody assault on May 19. We know a bit about the chain of friendship between some of the slain soldiers because of a letter written many years later by William Sparks, a veteran of the fight who became a physician after the war. Thomas Sparks may have located one or two graves of his old friends, since 17,000 Union soldiers are buried at Vicksburg. Christopher Lovewell is apparently one of those interred as “Unknown."